Our database contains details on literally hundreds of new Hotel Construction projects. Our research team track these projects from pre-planning phase right through to site commencement. We provide our subscribers with key data on the size and scale of each development, including contact details for design teams, engineers and contractors as well as an estimated construction value. 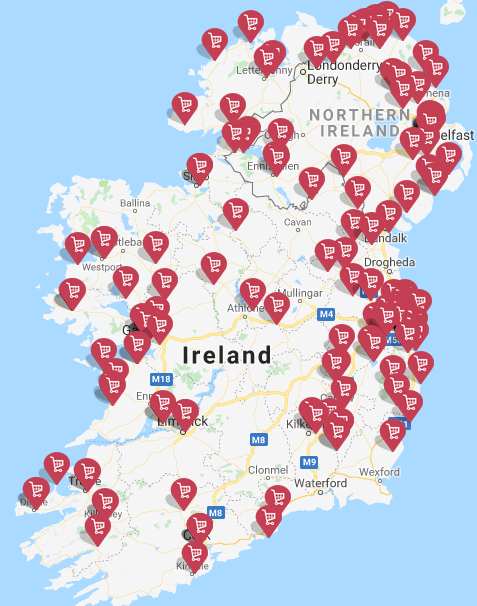 Many of Ireland’s leading suppliers to the Hotel and Hospitality sector rely on BuildingInfo.com to keep their sales and supply pipelines topped up. Register for our free trial today for more details on all Hotel Construction projects in Ireland. The table below provides a sample of Medical Construction projects commenced in the last 3 months. Each of these Medical Construction projects has a construction value of greater than €1 million. At Building Information Ireland we provide our subscribers with full details on all Medical Construction projects taking place throughout Ireland and Northern Ireland. To access details on all of the projects listed above please register for your FREE TRIAL here. Construction & planning activity by sector during September 2018. The table below outlines the volumes of projects either submitted for planning, granted planning permission or commenced construction. Register for our FREE TRIAL to access details on projects listed. At Building Information Ireland we research and publish data on all Construction Projects throughout Ireland. 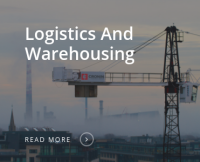 We cover all sectors and provide our subscribers with accurate information on the size and scale of all construction projects as well as the key contact details of the companies involved. 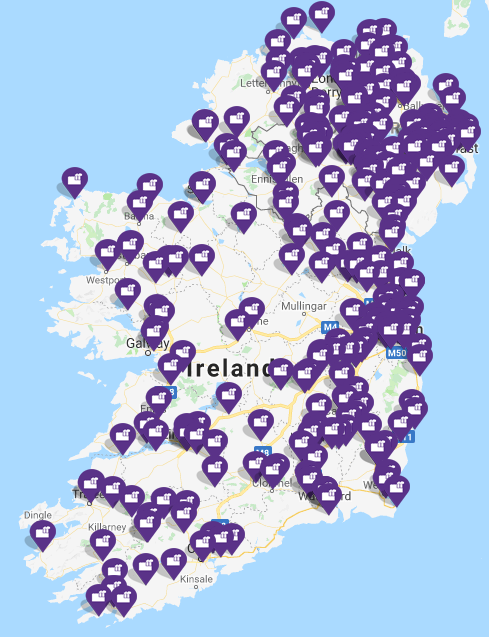 Through our dedicated research team at Building Information Ireland we research and publish details on all Industrial Construction Projects submitted for planning in all 32 counties. The image below details 186 Hotel and Guesthouse Construction projects submitted for planning during 2018 year-to-date. 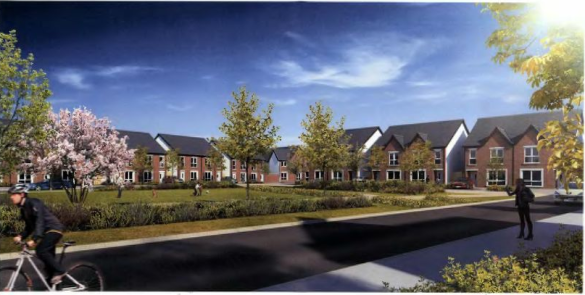 The largest of these schemes, by build value estimate, is the 177 room Killeen Castle Development in Co. Meath which was submitted for planning in May and was subsequently granted planning permission at the end of June. Building Information Ireland research and publish key information on all Hotel construction projects throughout Ireland. Our clients use this valuable sales generating data to strategically direct their sales and marketing teams and to keep up-to-date with the latest developments in this sector. We offer a free trial and demonstration of this online business tool. In this year-end volume of the Building Information Index the levels of activity in the construction industry are compared and analysed across the 3 full year periods of 2015, 2016 & 2017. The activity is broken down into key sectors and regions, and also across important stages of the construction and planning life cycle. The key message displayed in the findings of this Index is that output has increased steadily year on year over the 3 year period and will continue to grow in the short to medium term. While the growth rate may be slowing marginally, we forecast growth in the region of 9% for 2018 with the likelihood of positive growth continuing into 2019. The value of Construction Project Commencements grows by +31% in 2017 when compared with 2016. The value is up +67% when compared with 2015. Construction projects with a combined value of €10.7bn Building Information Ireland commenced in the year. Growth was recorded in 6 of the 7 sectors analysed with only Industrial project commencement activity showing a year on year decline. Dublin continues to dominate the industry where over 51% of the entire country commencements took place in 2017. This trend is growing with the same calculation last year showing Dublin at 45%. Residential developments accounts for 54% of Project Commencements in 2017 which is consistent with 2016 and shows the importance it is to the industry as a whole. The value of construction project Applications is up +11% in 2017 and +16% for the 2 year period to 2015. Overall, the pipeline of project Applications was €23.2bn for 2017, up from €20.8bn in 2016. Again Dublin accounts for the largest share, but the percentage is falling, and now stands at just under 39% of the overall, compared with 44% last year. Residential projects also make up the lion’s share of project Applications with €14.9bn worth of applications, just over +64% of all applications by volume. Commercial & Retail, the second largest sector recorded a decrease in Applications, -13%, as did 4 other sectors in 2017. This points to a potential cooling off in construction output in the medium term with growth rates remaining in single digits at best through 2019 and 2020. How do Proline hardware specialise for the Irish construction sector? the leading companies for the supply of ironmongery into various construction projects. full scheduling service for all projects. What other services do Proline provide? What recent projects have you been involved in? platform and the email alerts keep us to date on important project commencements. How do GlenVac specialise for the Irish construction sector? Glenvac are the primary supplier and installers of Husky™ built in Central Vacuum Systems throughout Ireland and with over 20 years of experience, provide an unparalleled level of expertise and service. We have completed in excess of 10 thousand central vac systems in Ireland for private houses all over Ireland in the past twenty years. Husky™ offers the widest choice of central vacuum systems in Ireland on the market, including disposable bag vacuum systems, hybrid cyclonic, wet and dry, and H2O models. They can be installed in new or existing homes or commercial premises and can cover up to 10,000ft² (1,000m²). What other services to Glenvac provide? In today’s energy conscious world, the regulation of thermal performance of buildings has created a need for more efficient ventilation systems to minimise heat loss and unnecessary energy consumption. To meet this demand, GlenVac now offer a Heat Recovery Ventilation System (HRV) which provide contact controlled ventilation to homes without creating cold draughts or increasing the heat loss normally caused by ventilation. This system is complemented by an innovative air distribution system made up of semi-circular ducting that is both compact and easy to install, bringing savings in space and time spent on-site. Heat Recovery Ventilation extracts warm moist air from rooms such as bathrooms and kitchens and uses the heat of this stale air to warm the cooler fresh air from outside. This warmed fresh air is then supplied into living rooms and bedrooms. To learn more watch this short video. Glenvac supply and install Heat Recovery Ventilation systems throughout Ireland for both domestic homes and commercial buildings. A system can be installed within 2-5 days for an average sized domestic dwelling and prices start from £2500. 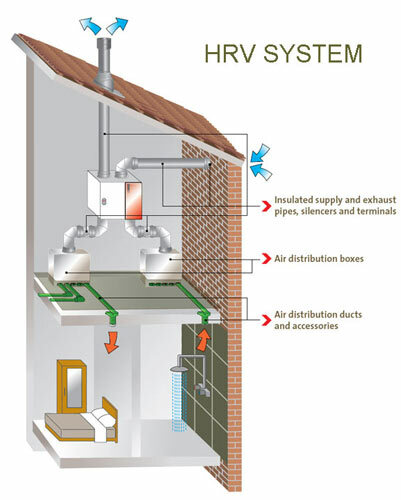 Typical payback for the Heat Recovery Ventilation systems range from 7-10 years, however there are many health benefits as the system contributes to a much healthier living environment. You have been subscribed to BuildingInfo for some time now – has it been beneficial to date? Absolutely – The BuildingInfo website has become crucial in helping us to identify projects of interest in an easy and timely manner. It boasts a really user friendly platform and the email alerts keep us to date on important project commencements. Details on Glenvac range of services, products and expertise can be found on their website. Call Owen McNamee on +353 (0)87 9459214 or email for further details. How important is the construction sector for your business? Do you specialise in any way for the Irish construction sector? We’ve built a reputation for moving heavy intricate materials that include the likes of The Christ the King Statue which we moved from Dun Laoghaire Park to make way for the building of the new library https://www.youtube.com/watch?v=Cf86_-xIPgE, and Industrial generator moving and electrical system installs for Stewart Construction on-site at the newly built section of Beaumont Hospital. The reputation we have gained is due to the care we bring to our work, but the reality is that we bring that care to every project. 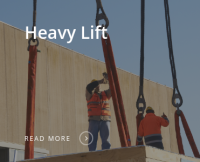 Up to 20 tonne is where we shine, but are happy to manage any size project given our alliance with many international providers of heavy lift equipment to fulfil client needs. We’re very conscious of health/safety and compliance issues and this is very much part of our internal value system and culture. We read about so many large projects being completed, large data centres for example, are there any similar projects that you have been involved in recently? It’s been fantastic to see the Irish construction sector start to flourish again on the back of many hard years for the industry. Thankfully, our historical reputation and excellence in delivery saw us through the down turn and we’re starting to see significant increases in demand for our services in the past twelve months. We are currently involved with the new €200m Facebook Data centre development in Clonee, Co. Meath, providing technical machine moving, and office relocation requirements. We are also involved in the €11m development for RCSI Education and Research Centre at Beaumont Hospital. Whether You Are Moving A Pencil Or A Transformer Cronin Movers Can Help. Service, transparency and a focus on excellence is deep within their ethos. Having invested significantly in their team and infrastructure they are proud of the work they produce on behalf of their many clients across the Irish marketplace. 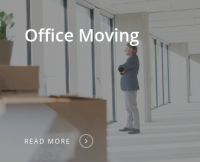 Ongoing training supports their philosophy of ensuring they remain as the go-to company in Ireland for Office Moving, Heavy Lift Relocation Engineering and Focused Logistics. Established in 1988, they bring a wealth of experience and expertise supported by a rigorous process around project management. Their ISO Certification and engagement with global bodies responsible for guiding health & safety policy, supported by their engagement with industry allows us to provide excellence in all that they do. Building Information Ireland is Irelands leading provider of researched construction projects activity.